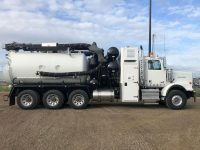 HydrovacTrucksForSale.Com specializes in selling new, used and custom built hydro-vac, combo-vac, straight-vac and other vacuum and heavy trucks. We work with customers operating oilfield service companies, sewage and septic companies, construction contractors and any other industrial client who needs to add more trucks to their portfolio of revenue generating equipment. With our combined years of experience working with business owners who are operating hydro-vac equipment daily we have a unique perspective and insight into the needs of businesses like yours. Our professional sales staff understand our product and how hydro-vac units can make a difference in the bottom line of your business. We have inventory available in Canada currently and our trucks can always be shipped or driven to your location. We can take care of all the arrangements for you. We have inventory available in the USA (in several states) currently and our trucks can always be shipped or driven to your location. We can take care of all the arrangements for you.